Since January, members of NASBA’s new Government Agency Referral Task Force, chaired by Ellis Dunkum (VA) and supported by Gerald Burns (OR), Dwight Hadley (NY), Laurie Tish (WA) and staff liaison Linda Biek, have met with representatives of the Office of Management and Budget (OMB), the Government Accountability Office (GAO) and the Department of Education (DOE) to promote the activities of state boards and provide education regarding their efforts to protect the public. Additional meetings with four other Federal agencies have been planned for May 2008. The task force was formed to indentify methodologies by which state boards can be more effective in working with Federal and State regulators that refer substandard work. In carrying out their charge, the Task Force members have used a two-pronged approach: besides establishing and nurturing relationships with government agencies, they have proposed a governmental agency referral process, and solicited the board’s comments on the proposal. As drafted, the process would begin with the federal agency’s notification to the state board informing them that a CPA or firm had performed substandard work. 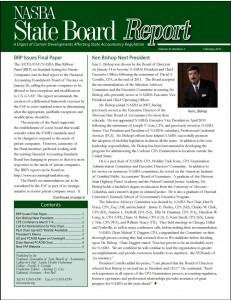 NASBA would receive a copy of the transmittal that would be entered into a system to allow NASBA to periodically update the agency on the status of the referral, with the state board notifying the agency of its final disposition. Task Force Chair Ellis Dunkum observed that the comments received from the boards evidenced their support for a proactive approach to avoid criticisms of the state boards, but indicated that some are prohibited from revealing even the pendency of a complaint. The Task Force has considered these comments and will be proposing an alternative approach in the near future. He said the Task Force appreciated the input of the many states that participated in the survey and requests their continuing participation as the proposal is revised.